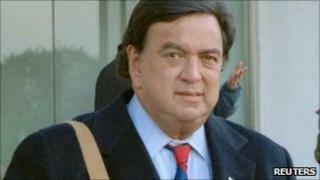 Bill Richardson, the governor of New Mexico, is a veteran lawmaker who has visited North Korea on multiple occasions. One of the most high-profile Hispanic-Americans on the US political scene, he is no stranger to government, having served under Bill Clinton as UN ambassador and energy secretary. He was offered the role of commerce secretary by Barack Obama after an abortive presidential run in 2008 but turned it down because of a federal probe that was later dropped. On his trips to Pyongyang, he has been serving as an unofficial liaison with a country with whom the US has no diplomatic ties. On two occasions he helped secure the release of US nationals detained in North Korea and on another the return of the remains of US servicemen killed in the Korean War. He has also held talks with North Korean diplomats in the US on several occasions. His most recent visit to Pyongyang came in December 2010, in an effort to calm rising tensions between the two Koreas. Born in Pasadena, California, in 1947, to a Spanish-born mother and a Nicaraguan-born father, Mr Richardson grew up in Mexico City, before attending boarding school in Massachusetts. After graduating from Tufts University, he worked on the staff of the Senate Foreign Relations Committee, before entering politics as congressman for New Mexico's third congressional district. He served as a congressman from 1983 until 1997, when Bill Clinton picked him to become America's ambassador to the UN. During his time there, he assisted President Clinton's efforts to bring peace to the Middle East. In 1998, he returned to Washington to serve as energy secretary, a role which he performed until the end of Mr Clinton's administration in 2001. After a brief period in private life, Mr Richardson ran for the New Mexico governorship in 2002, an election he won 59% to 39%, in the process breaking the world record for the most handshakes given by a politician - 13,392 in eight hours. His victory made him the only Hispanic governor of a US state. He comfortably won re-election in November 2006, increasing his winning margin to 36 percentage points. His foreign policy experience and record as a governor made him one of the front-runners for the Democratic presidential nomination in 2008. With his humorous turn of phrase and energetic speaking style, he was certainly one of the more entertaining presidential candidates, and his jokes enlivened many a presidential debate. But after disappointing fourth-place finishes in both the Iowa caucus and the New Hampshire primary, Mr Richardson dropped out of the race on 10 January 2008. His name hit the headlines again on 21 March when he publicly endorsed Barack Obama, a move viewed as a betrayal by many Hillary Clinton supporters, who felt that Mr Richardson owed his career to Mrs Clinton's husband. James Carville, a close aide and friend to the Clintons, compared Mr Richardson to Judas Iscariot. At the time, some commentators accused Mr Richardson of making his endorsement in the hope of landing a senior position in any future Obama administration - possibly even the role of secretary of state, a role that Mrs Clinton went on to occupy. He was then tipped as commerce secretary - but only days before Senate confirmation hearings were due to start, Mr Richardson announced he was withdrawing his name from the process. His decision was prompted by a pending investigation into a company that has done business with his state. Mr Richardson said he was confident he would be cleared of wrongdoing but was standing down because he did not want to delay the work of Mr Obama's new administration. The investigation was later dropped. His second term as New Mexico governor expires in 2011 and he cannot run for a third term.